Sir Geoffrey Charles "Geoff" Hurst MBE (born 8 December 1941) is a former England international footballer. A striker, he remains the only man to score a hat-trick in a World Cup final as England recorded a 4–2 victory over West Germany at the old Wembley in 1966. He began his career with West Ham United, where he scored 242 goals in 500 first team appearances. There he won the FA Cup in 1964 and the European Cup Winners' Cup 1965. He was sold to Stoke City in 1972 for £80,000. After three seasons with Stoke he finished his Football League career with West Bromwich Albion in 1976. Hurst went to play football in Ireland (Cork Celtic) and the USA (Seattle Sounders) before returning to England to manage non-league Telford United. He also coached in the England set-up before an unsuccessful stint as Chelsea manager from 1979 to 1981. He later coached Kuwait SC before leaving the game to concentrate on his business commitments. In total he scored 24 goals in 49 England appearances, and as well as success in the 1966 World Cup he also appeared at UEFA Euro 1968 and the 1970 FIFA World Cup. He also had a brief cricket career, making one First-class appearance for Essex in 1962, before concentrating on football. Hurst was born in Ashton-under-Lyne, Lancashire, on 8 December 1941. He had two younger siblings: Diane and Robert. His family moved to Chelmsford, Essex when he was six years old. His father, Charlie Hurst, was a professional footballer who played at centre-half for Bristol Rovers, Oldham Athletic and Rochdale. His mother, Evelyn Hopkins, was from a Gloucestershire family with her mother's side originally from Germany. As a teenager he was obsessed with football, and was once fined £1 for disturbing the peace after consistently kicking a football into his neighbour's garden. Hurst played one first-class cricket match for Essex, against Lancashire at Aigburth in 1962, although it was not a successful outing: he made 0 not out in the first innings, and was bowled by Colin Hilton, again for 0, in the second. However, he appeared 23 times in the Essex Second XI between 1962 and 1964, usually as a wicketkeeper, before concentrating entirely on football. 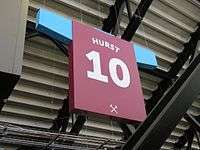 Hurst's footballing career began when he was apprenticed to West Ham United at the age of 15. Manager Ted Fenton first selected him for a senior game in a Southern Flootlight Cup tie with Fulham in December 1958. He turned professional at the club four months later, and was paid £7 a week with a £20 signing on fee. His first competitive appearance came in February 1960 when injuries forced Fenton's hand; Hurst put in an indifferent performance and the team lost 3–1. He made only two further appearances in the 1959–60 season, and realised that Bobby Moore was making better progress in the same position than he was. He played six times in the 1960–61 campaign and seriously considered turning his main focus to cricket. In April 1961 Ron Greenwood took over as manager, and drastically changed team training by putting a focus on footballing skill rather than physical fitness. Hurst missed the start of 1961–62 pre-season training due to his cricketing commitments, but went on to make 24 appearances at left-half, and scored his first goal for the club in a 4–2 victory over Wolverhampton Wanderers in December 1961. However he again missed pre-season training the following summer and was dropped after proving to be unfit during the opening game of the 1962–63 season. In September of that season Greenwood tried playing Hurst as a striker after deciding that the defensive side of his game was a weakness for the young midfielder. He formed a successful partnership with Johnny Byrne and went on to score 13 goals in 27 First Division games whilst Byrne scored nine in 30 games in the 1962–63 season. In the summer of 1963 he joined the club on their pre-season tour of New York, and greatly benefited from playing against top quality players from clubs across the world in a friendly tournament. Hurst and West Ham had a poor start to the 1963–64 season, and went on to finish in 14th place. However it was in the FA Cup where the team impressed. A comfortable 3–0 home win over Second Division Charlton Athletic was followed by another 3–0 home win over East End rivals Leyton Orient – though only following a tough 1–1 draw at Brisbane Road. Greenwood named the same 11 players, including Hurst, in all the club's seven FA Cup fixtures as West Ham progressed to the final. Hurst scored one against Charlton and two against Orient, and claimed another goal in the Fifth Round as West Ham beat Second Division Swindon Town 3–1 at the County Ground. Burnley provided a stern test in the quarter-finals, but a 3–2 home win took West Ham into the semi-finals, where they faced Manchester United at Hillsborough. West Ham won 3–1, with Hurst scoring the final goal of the game after being set up by Bobby Moore. West Ham faced Second Division Preston North End at Wembley in the 1964 FA Cup Final, and had to come from behind twice to win the match 3–2. Hurst scored his side's second equaliser with a header that bounced under the crossbar and ended up just over the goal line. The club's success won them a place in the European Cup Winners Cup for the 1964–65 season. They deteated Belgian side K.A.A. Gent in the First Round after an unconvincing 2–1 aggregate victory. Czechoslovakian side AC Sparta Prague awaited in the second round, and West Ham progressed with a 3–2 aggregate victory despite the absence of Moore. Despite beating Swiss team FC Lausanne-Sport 6–4 on aggregate in the quarter-finals, Hurst had still not registered a goal in the competition as he was played in a withdrawn role behind Johnny Byrne so as to strengthen the midfield. In the semi-finals, West Ham defended a 2–1 home win over Spanish club Real Zaragoza with a 1–1 draw at La Romareda to claim a place in the 1965 European Cup Winners' Cup Final against TSV 1860 München at Wembley. West Ham won 2–0, with Alan Sealey scoring both goals to give the club their first European trophy. Having scored 40 goals in 59 competitive games in the 1965–66 season and then gone on to make himself a household name by winning the World Cup with England, Hurst was the subject of a £200,000 transfer offer by Manchester United manager Matt Busby – the offer was rejected by Greenwood. He was in the West Ham side which lost the League Cup final 5–3 on aggregate to West Bromwich Albion. In the 1966–67 season, West Ham demonstrated the inconsistency that would deny them a realistic prospect of winning a league championship under Greenwood. Hurst scored a hat-trick as they defeated full-strength title challengers Leeds United 7–0 in the League Cup, but they exited the FA Cup with a 3–1 defeat to Third Division side Swindon Town. "When you're playing for a team that can score seven one day and four the next it's really quite good fun. When job satisfaction is that high, why would you want to play for anyone else?" — Like his manager, Ron Greenwood, Hurst valued entertaining attacking football played in a fair manner and was not prepared to sacrifice these values for silverware. Hurst scored six goals in a First Division match against Sunderland at Upton Park on 19 October 1968, which West Ham won 8–0. However he regretted admitting that he handled the ball in his first goal which led to the back page headlines focusing on the illegitimate goal rather than the rare feat of one player scoring six goals in one game. In 1972, West Ham reached the semi-finals of the League Cup when they played Stoke City over two legs. In the home leg at Upton Park, they were awarded a penalty after Harry Redknapp was fouled in the box. Hurst took the penalty and struck a powerful shot into the top corner which was saved by Gordon Banks, who succeeded in deflecting the ball over the bar. Stoke won the tie in the subsequent replay and denied Hurst one final appearance at Wembley. Hurst was sold to Stoke City for a £80,000 fee in August 1972. He was struck down with pneumonia early in 1973 and went to South Africa to recover, playing on loan for Roy Bailey's Cape Town City. He missed just four games for Stoke and upon his return he helped the side to maintain their First Division status. In January 1974, "Potters" manager Tony Waddington asked Hurst to take in new signing Alan Hudson as a lodger so as to provide the talented but troubled midfielder with a stable home during his Stoke career. Hudson adapted well to life in the Hurst household and Stoke recorded a fifth place in the 1973–74 season – a career high for Hurst. Hurst scored 11 goals in 41 games in the 1974–75 season and helped Stoke to finish in fifth place, just four points behind champions Derby County. Hurst was sold to Johnny Giles's West Bromwich Albion in the summer of 1975 for a fee of £20,000. He played 12 times for the Baggies at the start of the 1975–76 season, scoring twice, before deciding to leave for America. Hurst later acknowledged that at the age of 34 he was too old to lead the line in the "Baggies" push for promotion out of the Second Division. Hurst signed for Cork Celtic in January 1976, and remained in Ireland for one month. He signed for the Seattle Sounders of the NASL in 1976. Hurst rapidly proved his worth, and became a valuable member of the Sounders team. He was the team's second-leading scorer, helping the Sounders make it to the play-offs for the first time in their brief history, with eight goals and four assists in 23 regular season games, and one goal in the play-offs. Hurst made his senior England debut against West Germany on 23 February 1966. He played well, and further performances against Scotland and Yugoslavia secured him a place in the squad for the 1966 FIFA World Cup. However he put in mediocre performances in warm-up games against Finland and Denmark, and so Jimmy Greaves and Roger Hunt were instead picked for the final friendly game against Poland. Greaves and Hunt were indeed picked for the three group games against Uruguay, Mexico and France, but in the latter game, Greaves suffered a deep gash to his leg which required stitches, and Hurst was called up to take his place in the quarter final against Argentina. Argentina were talented but preferred a tougher approach to the game, which saw them reduced to ten men. The game was still tightly contested as it entered its final 15 minutes, but then Peters swung over a curling cross from the left flank and Hurst, anticipating his clubmate's thinking, got in front of his marker to glance a near post header past the Argentine keeper. England won 1–0 and were in the semi-finals. Greaves was not fit for the game against Portugal so Hurst and Hunt continued up front, and England won 2–1 thanks to a brace from Bobby Charlton, the second of which was set up by Hurst. As the final against the Germans approached, the media learnt of Greaves' return to fitness and, while appreciating Hurst's contribution, started to call for the return of England's most prolific centre-forward. Ramsey, however, would not be swayed and selected Hurst for the final. West Germany took the lead through Helmut Haller early on, but six minutes later Moore was fouled just inside the German half of the field. He quickly picked himself up and delivered the free kick to Hurst, who eluded his marker Horst-Dieter Höttges and headed the ball past goalkeeper Hans Tilkowski to level the scores at 1–1. With 12 minutes left to play of normal time, an Alan Ball corner left Hurst with a shooting opportunity on the edge of the penalty area; his shot deflected off Wolfgang Weber and fell kindly to Martin Peters, who put the ball into the net to give England the lead. However the Germans equalised through Weber to level the match at 2–2 at full-time. In the first period of extra-time, Ball made a cross across the near post to Hurst, who struck a strong shot towards goal with his right foot, falling backwards as he did so. The ball beat the goalkeeper, hit the crossbar and bounced down before Weber headed it out for a corner. England's players claimed a goal whilst the Germans were adamant that the ball had not fully crossed the line. Referee Gottfried Dienst consulted his linesman on the right flank, Tofiq Bahramov, who signalled that the ball had crossed the line, and the goal was given. And here comes Hurst, he's got ... [notices invaders] ... some people are on the pitch, they think it's all over! [Hurst shoots and scores] ... It is now! It's four! Hurst was selected for UEFA Euro 1968, but did not play as England lost 1-0 to Yugoslavia in the semi-final. He did play, and score, in the 2-0 third-place play-off victory over the Soviet Union at the Stadio Olimpico. Hurst scored his second international hat-trick on 12 March 1969, in a 5–0 victory over France, and was named in the Ramsey squad which played in Mexico to defend the World Cup in 1970. He scored the only goal of England's opening game against Romania after being sent through on goal by Francis Lee. England progressed to the quarter finals, where once again they faced West Germany. Hurst played a part in a goal for Martin Peters which put England 2–0 up, but the Germans forced their way back to 2-2. At 2-2, however, Hurst had a legitimate goal ruled out for offside. The Germans scored and won 3–2. Hurst scored against Greece and Switzerland in qualification for UEFA Euro 1972, but played his last international match on 29 April 1972 as England were beaten 3–1 by West Germany – he was replaced by Rodney Marsh with 20 minutes left to play and did not take to the field in an England shirt again. He was named in the squad for the second leg against Germany after Allan Clarke and Francis Lee picked up injuries, but had to pull out of the squad after picking up an injury himself. Upon his retirement from playing, Hurst moved into management and coaching. He spent three years as player-manager of Telford United in the Southern League before being recruited by Ron Greenwood in the England coaching set up in 1977. He travelled with England to help Greenwood at UEFA Euro 1980 and the 1982 FIFA World Cup, where England failed to make it past the group stages on both occasions. Hurst joined Chelsea, then in the Second Division, before the 1979–80 season, initially as assistant manager to Danny Blanchflower. When Blanchflower was sacked, Hurst was appointed manager. He hired Bobby Gould as his assistant. Things initially went well, and for much of the season Chelsea were on course for promotion, but two wins from their final seven league games ensured the club finished fourth. He raised £250,000 through the sales of Eamonn Bannon, David Stride and Trevor Aylott. He then spent £300,000 on Colin Lee, Dennis Rofe and Colin Viljoen; he later acknowledged Viljoen as a mistake whilst bemoaning Lee's bad luck with injury. The following season again began well, with the "Blues" among the early promotion pace-setters before a dismal run set in, with Chelsea scoring in just three of their final 22 league matches, culminating in Hurst being sacked on 30 April 1981 and Chelsea finished 12th in the league. After being sacked from Chelsea on 23 April 1981 Hurst worked as an insurance salesman for Abbey Life. The next year he was tempted back into management after being offered a generous salary by Kuwait SC. He controversially disciplined and dropped club captain Saad Al-Houti, but was unable to challenge Dave Mackay's Al-Arabi for dominance of the Kuwaiti Premier League. After leaving Kuwait in April 1984 he returned to the insurance trade. In 2003 Hurst was included in The Champions, a statue of 1966 World Cup winning footballers, by sculptor Philip Jackson. 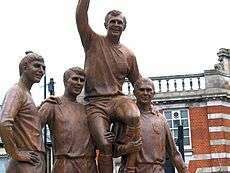 It sits at the junctions of Barking Road and Central Park Road, Newham, London, near to West Ham United's Boleyn Ground and features Martin Peters, Hurst, Bobby Moore and Ray Wilson. Hurst's contribution to the English game was recognised in 2004 when he was inducted in the English Football Hall of Fame. Hurst is also one of the few footballers who have been knighted. A new statue of Geoff Hurst by Sculpture for Sport was unveiled outside local club Curzon Ashton in December 2010. He is shown alongside fellow 1966 squad member Jimmy Armfield and Simone Perrotta, all World Cup medal winners born in what later became the borough of Tameside whose council commissioned the work. He now lives in Cheltenham, Gloucestershire, with his wife Judith. They have been married since 13 October 1964, having met three years previously at a youth centre; Eddie Presland was best man. They have three daughters. A. ^ The "Other" column constitutes appearances and goals in the FA Charity Shield, Texaco Cup, UEFA Cup, UEFA Cup Winners' Cup and Watney Cup. B. ^ Statistics for Kuwait SC and Telford United not included. ↑ "Geoffrey Charles 'Geoff' Hurst — Goals in International Matches". The Rec.Sport.Soccer Statistics Foundation. Archived from the original on 15 October 2013. ↑ "Geoff Hurst player profile". Cricinfo.com. Retrieved on 12 September 2008. ↑ "Lancashire v Essex, County Championship 1962". CricketArchive.com. Archived from the original on 10 February 2009. Retrieved on 12 September 2008. ↑ "Second Eleven Championship Matches played by Geoff Hurst (23)". CricketArchive.com. Archived from the original on 10 February 2009. Retrieved on 12 September 2008. ↑ "Sunderland match preview | News | Latest News | News | West Ham United". Whufc.com. Retrieved 14 March 2011. ↑ "Welcome to the Wonderful World of West Ham United Statistics Geoff Hurst". Retrieved 24 November 2011. 1 2 3 Matthews, Tony (1994). The Encyclopaedia of Stoke City. Lion Press. ISBN 0-9524151-0-0. 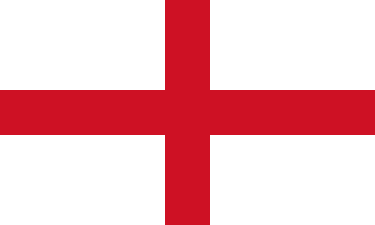 ↑ England: The Official F.A History, Niall Edworthy, Virgin Publishers, 1997, ISBN 1-85227-699-1. ↑ "The Champions". www.phillipjacksonsculptures.co.uk. Retrieved 15 February 2013. ↑ "World Cup hero's home town statue in Greater Manchester". www.bbc.co.uk. 2011-02-07. Retrieved 4 March 2011. 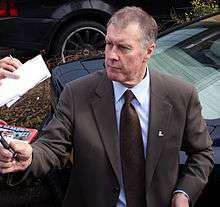 ↑ "Memories wanted for Geoff Hurst book". www.thisisgloucestershire.co.uk. Retrieved 21 October 2013. ↑ Pearlman, Natasha (8 June 2006). "Footballers' wives of 1966 relive the memories". Daily Mail. London. ↑ The London Gazette: (Supplement) no. 47888. p. 9. 26 June 1979. ↑ The London Gazette: (Supplement) no. 55155. p. 2. 15 June 1998.